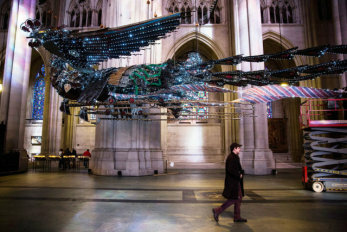 A pair of phoenixes have winged their way to the Cathedral of St. John the Divine in New York City. Weighing in at 6 tons apiece and measuring 100 feet, one would think these creatures hailed from the Mesozoic Era of dinosaurs or escaped from a Steven Spielberg movie set of a sequel to Jurassic Park. Instead they're the creation of a sculptor who transported his massive work of art from the East to the West. 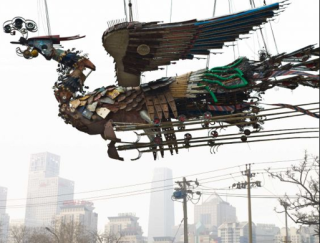 Xu Bing, an internationally acclaimed Chinese contemporary artist created this sculpture from construction debris, tools and hard hats used in the daily lives of Beijing's migrant laborers. The project first began in 2008 when the Mr. Xu was asked to create a work of art for a glass atrium at the base of Construction Hats melded into Sculpturearchitect Cesar Pelli's World Financial Center building in Beijing's central business district. Differing from the phoenixes of ancient China which were benevolent creatures reflecting renewal and resurrection, this pair fashioned from the materials of a commercial development reflect the bleaker side of Chinese culture that recognizes the hard-working citizens of China today. 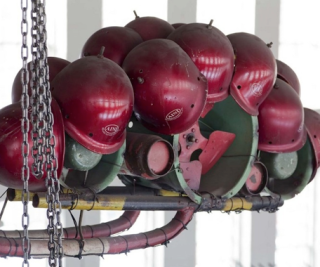 The sub-standard working conditions of Chinese laborers who built luxury high-rises was perceived by Mr. Xu as an oxymoron. He described it as making his "skin quiver.” In fact, he had such a violent reaction to what he saw, he decided to make his phoenixes appear to rise, as if they were ascending from debris to reach heavenly heights. When the financial crisis of 2008 hit China, the building's developers became leery of the message the birds conveyed. So when they asked Mr. Xu to enhance the sculpture ornamentally, he declined a nd proceeded to seek out a new venue for the work. From there it made several stops in the Western World including the Massachusetts Museum of Contemporary Art before it arrived in New York City, January, 2014 on nine flatbed trucks. Once inside the world's largest Gothic Cathedral, the phoenixes were raised using over 30 hoists and 140 feet of trussing, so they would appear as if they were soaring through the cathedral. For those who've not seen the sculpture yet, there is a unique opportunity coming up where you can combine your viewing with a Paul Winter concert. On June 21, new music will premiere at this musical troupe's upcoming annual event. Titled, the Summer Soltice Celebration 'Morning of the Phoenix,' the inspiration for this year's theme is dedicated to Mr. Xu's phenomenal achievement. This is a dramatic annual event that will be enhanced measurably by the sounds of Paul Winter and his Consort. Since the first hour of the event occurs before sunrise, the audience will be seated in complete darkness in the Nave under the Phoenix Birds. And for the first time, the musicians will actually be playing above the listeners positioned in balconies 100 feet up. "I have chosen instruments with strong voices that will project well in the natural acoustics of the Cathedral," says Winter. This year the Consort will include bass trombone, played by Chris Brubeck; oboe and bass clarinet, by Paul McCandless; French horn, by John Clark; and tuba, by Marcus Rojas - with Winter himself playing his soprano sax and Tim Brumfield accented the sound with the Cathedral's titanic Aeolian-Skinner pipe organ. 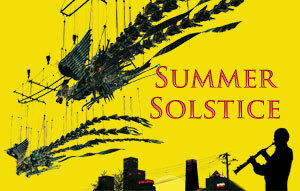 It's a rare occasion to rise to (pun intended) -- and a great way to welcome in this year's Summer Solstice! See you in the Nave? Puppy Experiences Rain For The First Time! The Animal Video Of The Day!! !